So, that time of year comes around again when the Evans family set forth for the summer tour en velo. 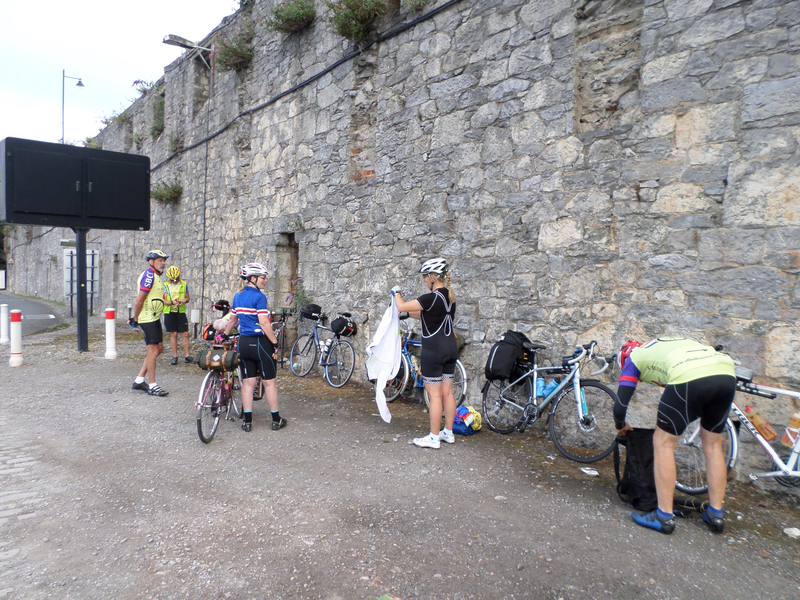 This time the départ would be in the company of fellow SBCC travellers, as they were catching the same ferry to Roscoff. We all assembled at the designated time and made the last minute checks that are meaningless given that there would be no time to return home before the ferry set sail . . .
. . . and case in point being the Skinner Custom Rear Rack: this, which he had fettled the previous night in order to reduce weight. 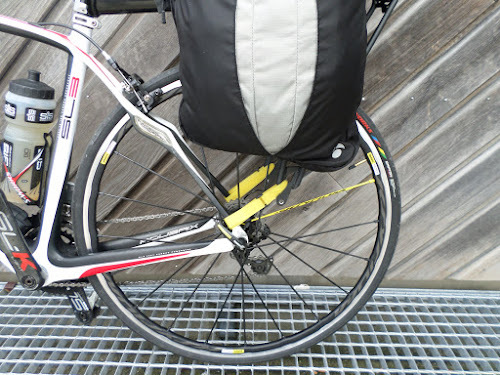 The trouble was that the erstewhile firmly positioned supports now pendulumed back and forth in and out between the spokes of the rear wheel – not a good thing when descending at speed if you don’t want to be eating a tarmac sandwich – this was pointed out by more than one of the assembled mechanics. How to fix it? If this had been 60 years ago then it would be a simple matter of fashioning a cantilever arrangement using a piece of knicker elastic requisitioned from S’s panniers . . . alas, the gossamer-like nature of modern grundies are not up to roadside DIY, so that idea was abandoned. Then we thought we could cut the elastic grippers off the the top of the Skinner leg-warmers, but the thought of Dave cycling around in 80s retro fashion when inclement weather necessitated their deploy was more than most of us could bear. As the assembled sages considered the problem I rooted through the depths of my Carradice saddlebag. Beneath a 10 year old energy bar and a bit of baguette, which had been there so long it had evolved its own race of sentient, bread-based beings, I found some long unused emergency velcro which turned out to be the perfect solution to the Skinner rocking stays – patent pending. So all was well, and everyone made it onto the ferry despite a 4×4 driver moaning at us about jumping the queue. This was odd because, as I mentally ponited out to him, YOU WILL SPEND THE NEXT 6 HOURS STATIONARY IN THE BOWELS OF A SHIP YOU ******* **** – he was clearly a Brexit voter. An uneventful crossing ensued and we sped in convoy to Morlaix where the traditional café au lait at Hotel d’Europe (now renamed Hotel d’Brexit) was imbibed. This is where we parted with our SBCC compadres, S and I to the Hotel St Melaine for a hot shower and slap up meal, and the rest to another 2-hours slog to Huelgoat for a run around under the shower and a slap up omlette at Le Brittany Pub. 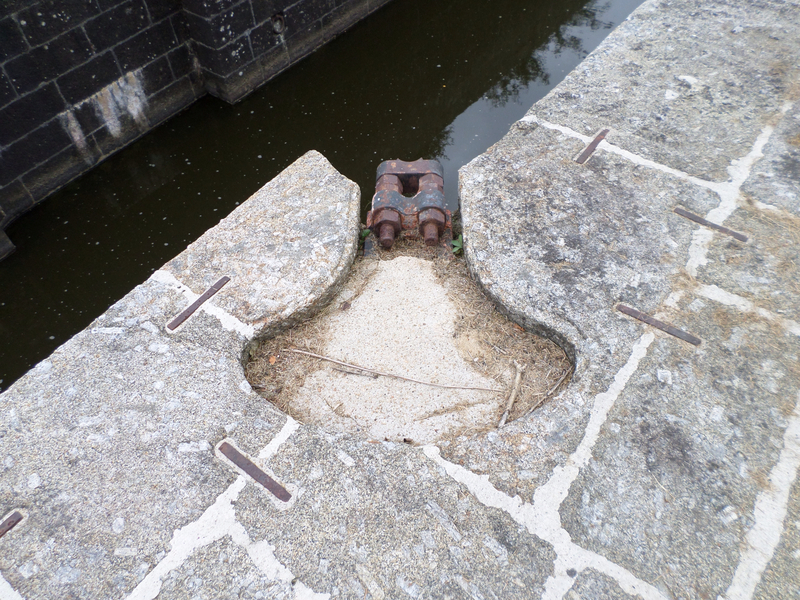 The route from Morlaix, South toward the Nantes-Brest Canal, is well wheeled by these intrepid travellers. So it was with a measure of confidence that we set forth, having briefly stopped to replenish our victuals at the Patisserie and Cave du Vin. 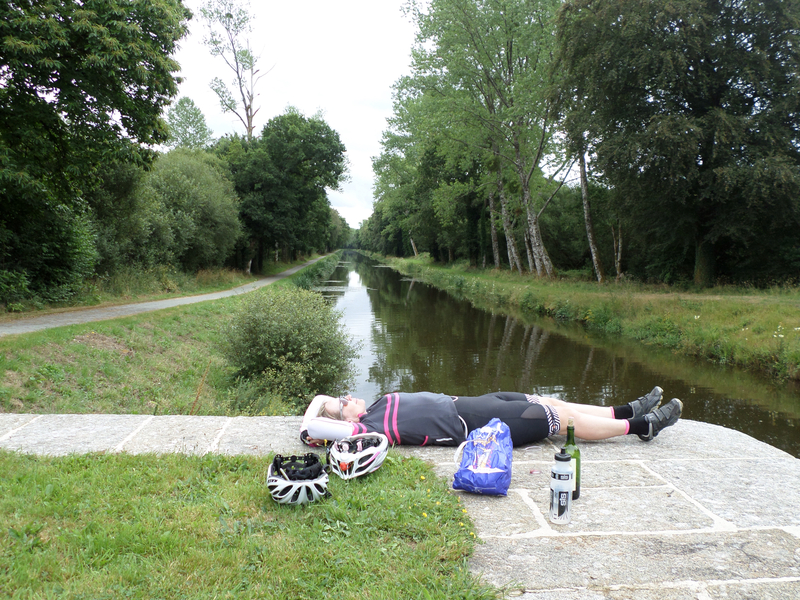 But for some reason the legs were hollow, and what should have been largely downhill became a distinctly uphill slog for most of the way to Rostrenen, where S needed a quick kip by the canal . . .
. . . before the for-real uphill slog. In her defence, she was wearing her new snazzy shorts for the first time on a long ride, so they were just being broken in. I did point out that it could have been worse, and offered to exchange her saddle for a more comfy one to ameliorate the chafe . . .